BUFFALO CHASE.—It is here seen that the buffalo chase becomes very dangerous when the calves are young, the male at that time always in attendance for their protection. Loan for display with permanent collection, Phoenix Art Museum, 1968-1969. Catlin Paintings Exhibit, Albrecht Gallery [now The Albrecht-Kemper Museum of Art], St. Joseph, Missouri, 1969-1970. World Hunting, organized by International Art Program of the National Collection of Fine Arts, shown at Budapest Museum of Fine Arts; U.S. Embassy, Vienna, Austria, 1971. Extended loan for use by Ambassador Strauz-Hupe, U.S. Embassy residence, Brussels, Belgium, 1972-1977. George Catlin: Pioneer Painter of the North American Indian, Montclair Art Museum, New Jersey, 1985-1986. 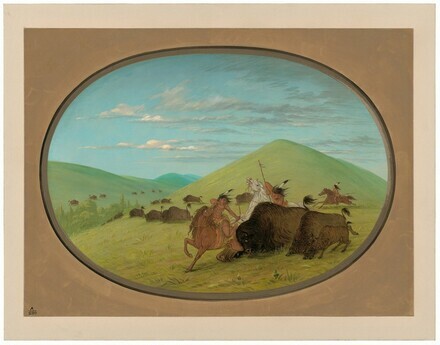 A Gallery Revived: North American Indian Paintings by George Catlin, Buffalo Bill Historical Center, Cody, Wyoming, 1989. North American Indian Paintings by George Catlin (NGA National Lending Service exhibition), Delaware Art Museum, Wilmington, 1990-1991. North American Indian Paintings by George Catlin (NGA National Lending Service exhibition), Palm Springs Desert Museum, 1992-1993. North American Indian Paintings by George Catlin (NGA National Lending Service exhibition), Boise Art Museum, Idaho, 1993. North American Indian Paintings by George Catlin (NGA National Lending Service exhibition), Hofstra Museum, Hofstra University, Hempstead, New York, 1994. North American Indian Paintings by George Catlin (NGA National Lending Service exhibition), West Bend Gallery of Fine Arts, Wisconsin, 1994. North American Indian Paintings by George Catlin (NGA National Lending Service exhibition), Lore Degenstein Gallery, Selinsgrove, Pennsylvania, 1995. North American Indian Paintings by George Catlin (NGA National Lending Service exhibition), Payne Gallery, Moravian College, Bethlehem, Pennsylvania, 1995, unnumbered brochure. American Paintings and Sculpture: An Illustrated Catalogue. National Gallery of Art, Washington, 1970: 32. American Paintings: An Illustrated Catalogue. National Gallery of Art, Washington, 1980: 43, repro. American Paintings: An Illustrated Catalogue. National Gallery of Art, Washington, 1992: 50, repro.